What it means to “be a feminist” is a loaded topic that can be easily misunderstood and stereotyped. And the same could be said for what it means to be labeled a “stay at home mom” in 2018. Some may even go as far as arguing a woman who chooses to stay home with her children instead of pursuing a job outside the home is anti-feminist. But while many women are leaning into a career, some are choosing to opt out and put their energy elsewhere once they become mothers. Is one choice more feminist than the other? We say no, it’s all a matter of your personal beliefs and actions. Here’s our take. Being a feminist and a stay-at-home mom are not mutually exclusive. Just because you are one, doesn’t mean you can’t be the other. When it comes to how we choose to parent and raise our children, many of us are constantly questioning what is best for our family. Each family’s personal situation is unique and when a baby comes into the picture we all have to make decisions about how to fit this new being into our existing lives. If it works out best for your family to have a mother stay home, it doesn’t mean she needs to hang up her feminist hat and succumb to the patriarchy. There was probably a lot of thought and care in making that decision and it doesn’t mean you have to let go of any beliefs you once held. While some families make the choice based on earning power versus the cost of childcare, it doesn’t mean you don’t believe that men and women should receive equal pay, even if that is not the case in your personal situation. The reality is that the pay gap exists and as much as women are working to close it, you have to make the choice of what is best for you and your family. You can continue to be an activist for women’s rights in many ways, even if you are not currently working outside the home. Having a “successful career” does not make you more of a feminist. Many of us were raised in a time when girls were finally being told we could be anything we wanted to be when we grew up. But that idea of being “something” was mostly focused on career. Yes, you can be a doctor, an artist, a teacher, or a business executive, but one can also choose to focus on mothering at home. Being one or the other doesn’t make you any more or less a feminist. Thanks to the first few waves of feminism, women have many more opportunities today than previous generations. While it is inspiring to see so many women, specifically moms, break through the glass ceiling, that doesn’t make them more of a feminist than those women who choose to focus their work on their family. We can model the beliefs of feminism in different ways, and for many it’s about having the power to make a choice, not limited by your gender. When women are in situations where they don’t have a choice, that is when women’s rights need to come into question. Having a career is not the only way women and men should be seen as equals. Gender roles can still be challenged when a woman chooses to stay home. Just because you choose to stay home with your children doesn’t mean you also need to be responsible for all of the housework and childcare responsibilities 24/7, even though the job is ever constant. If one parent is providing income by going to work most days that doesn’t automatically give them more power in the relationship, decision-making, or should it relieve them from all household commitments and chores. The parent that works outside the home can still help cook, clean, and care for the children when they are not at work. For some families, it helps to make lists and delegate the different task to one parent or another based on skills, time, interest, etc. Writing down everything that needs to be done for the children (including earning an income) and divvying up responsibilities may help to keep things more equitable. For most, being a SAHM is only temporary. 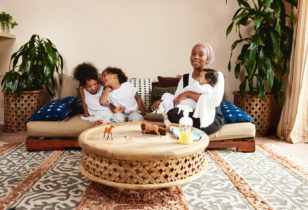 Some woman may choose to continue to stay home after their children are in school full-time, but for many, staying home in the early years is simply a “pause” to focus on motherhood. If you look at the number of years you may be working, compared to the amount of time you have young children, you will have so many more years to work and to focus on career and other passions. That doesn’t mean you have to pause, but if you do, it can be short-term. And today, many mothers who do choose to stay home actually haven’t stopped working at all. Some choose to go freelance in order to provide more flexibility, while others may take part-time work that they can do from home on their own time. We have also seen many mothers start their own business or make a huge career change after taking time to stay home with their children. Ultimately feminism is about our beliefs and how those beliefs shape our actions. You can teach your children about being a feminist by showing them you are a powerful career woman, a tireless community servant and activist, or by simply modeling mutual respect for all human beings and exposing them to diverse groups of people and opportunities. Making a choice to stay home is a privilege that does not exist for many women today. Until we have more public policies in place to support new mothers, a lot of women do not get to make the decision between staying home and going back to work. They often have to return to work sooner rather than later, maybe by choice, but often by necessity. Or they may be forced to leave their jobs because they don’t earn enough to cover the cost of childcare. In general, if the policies existed and there was less stigma around new parents taking time off of work, moms and dads would not be forced to make a choice between career and staying home with a new baby. With policies in place to help make up for lost wages, protecting job security, and providing additional benefits, staying home for a year wouldn’t be considered leaving your career and it wouldn’t be reserved as a privilege for two-parent households that have the financial stability from one income. Slamming any woman for her specific choices or situation in itself is anti-feminist. We have to remember that all of our personal choices are just that, personal. And we can’t let one part of who we are define us as a whole. There can be a lot of judgment, shame, and guilt, put on women and mothers today and the more we partake in that, the less feminist we are. We are equal, but we are not all the same. We may believe some of the same things, but it can lead us all down different paths. Ultimately, if we are truly feminists, we need to respect all women and mothers, no matter their choices. 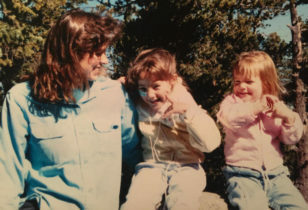 For some inspiring stories on stay-at-home moms, check out our Mother profiles on Cheri Messerli, Ari Serrano-Embree, and Sara Brawner.